a connective tissue cell that contains coarse, basophilic, metachromatic secretory granules that contain, among other pharmacologic agents, heparin, histamine, and eosinophilic chemotactic factor. These cells are involved in immediate hypersensitivity reactions and play a role in the regulation of the composition of ground substance. A cell found in connective tissue that contains numerous basophilic granules and releases substances such as heparin and histamine in response to injury or inflammation of bodily tissues. a constituent of connective tissue containing large basophilic granules that contain heparin, serotonin, bradykinin, and histamine. These substances are released from the mast cell in response to injury, inflammation, and infection. A ubiquitous immune surveillance cell, which is larger than basophils, with irregular and frequently elongated spindle shapes and cytoplasmic extensions. 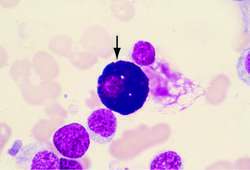 Mast cell (MC) nuclei are round and usually visible among the granules, which may overlay the edges of the nucleus slightly; the cytoplasm is usually packed with black or bluish-black metachromatic granules. MCs have a long—months to years—lifespan, in contrast to other “nonspecific” immune cells, such as PMNs (hours) or macrophages (weeks to months); they proliferate at the site of inflammation, have receptors for CR3 (complement), FcγR (IgG) and FcεR (IgE). Like basophils, MCs are activated by cross-linking of IgE on the cell surface and secrete neutrophil and eosinophil chemotactic factors, histamine, leukotrienes, neutral proteases, peroxidase, serotonin, superoxide dismutase, PGs and platelet-activating factor; factor release may be evoked by various substances (e.g., hormones, peptides, proteins, calcium ionophores, narcotics, muscle relaxants, dextran, complement C3a and C5a (anaphylotoxins)). The MC is detected by measuring serum trypticase, a neutral protease in MC secretory granules; levels > 4 ng/ml indicate systemic mast cell activation. Found in connective tissue, MCs secrete histamine and heparin, causing some of the changes of allergic reactions, phagocytoses and killing of bacteria. A connective tissue cell that contains coarse, basophilic, metachromatic granules; secretes heparin and histamine. A connective tissue cell found in large numbers in the skin and mucous membranes and in the lymphatic system. The mast cell plays a central part in allergic reactions. It contains numerous large granules-collections of powerfully irritating chemical substances such as HISTAMINE; SEROTONIN; HEPARIN; the proteases tryptase and chymase; CYTOKINES; PROSTAGLANDINS; and LEUKOTRIENES. In people with allergies, the antibody (immunoglobulin), IgE, remains attached to specific receptors on the surface of the mast cells. When the substance causing the allergy (the ALLERGEN) contacts the IgE, the mast cell is triggered to release these substances and the result is the range of allergic symptoms and signs. CHROMOGLYCATE can stabilize the mast cell membrane and prevent the release of the contents. 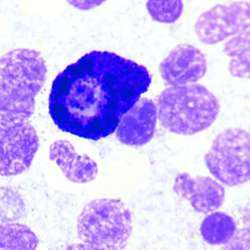 Mast cells closely resemble blood basophil cells, and the latter also carry receptors for IgE. The mast cell has recently emerged as an important element in the inflammatory events leading to joint damage in RHEUMATOID ARTHRITIS. See also ATOPY. a type of large, amoeboid cell found in the matrix of CONNECTIVE TISSUE, that produces HEPARIN and HISTAMINE and is probably important in quick-acting responses to ANTIGENS (see IMMUNE RESPONSE). A cell found in connective tissue that releases substances such as heparin and histamine in response to injury or inflammation of bodily tissues. Connective tissue cell that contains coarse, basophilic, metachromatic secretory granules that contain, among other pharmacologic agents, heparin, histamine, and eosinophilic chemotactic factor. n a connective tissue cell whose specific physiologic function remains unknown; capable of elaborating basophilic, metachromatic, cytoplasmic granules that contain histamine. a cell that may be derived from an undifferentiated precursor, which may be of monocytic origin, in the perivascular connective tissue. It elaborates granules that contain histamine, heparin and, in the rat and mouse, serotonin. It plays an important role in acute hypersensitivity (type I) reactions such as atopy and anaphylaxis. a benign, local aggregation of mast cells forming a nodular tumor that occurs in the skin of most species, but most commonly in dogs. The release of histamine or other vasoactive substances may be associated with gastroduodenal ulceration. These tumors may become malignant. See also mastocytosis. The hyperplasia of mastocytes in the abomasum mucosa is associated mainly with the presence of adult parasites and is greater in re-infections [10, 42], requiring a continuous stimulation on the part of parasitic antigens [4, 10]. Negative correlations have been registered between the values of EPG and mastocytes  and between these cells and the parasitic burden . Furthermore, there was a significant reduction in mastocyte and eosinophil numbers in mucosa and lower levels of specific anti-H.